Retention efforts can be looked at like any other initiative to reduce waste. Waste exists when activities generate costs that could be avoided, for a variety of reasons (e.g., policy of over compliance, expediency, simple lack of awareness). In their zeal to be compliant, many companies are over compliant which causes assets to be reported unnecessarily. In addition, there are assets available to be claimed IF companies are confident that their reporting is truly compliant. Keane offers Corporate Asset Recovery (CAR) and Liability Reduction & Remediation (LRR) to support client efforts to make their compliance process more efficient and turn it into a profit center. For the last 15 years, Keane’s CAR service has operated completely behind the scenes to locate funds owed to clients sitting in various levels of state and local government and bankruptcy courts. Keane’s CAR service also, prepares claim forms and provides the necessary documentation to enable clients to claim funds from the states. Conducted on a continual basis, Keane uses historical company data to ensure no stone is left unturned. The team utilizes past company names, lists of tax identification numbers, and related subsidiary information to locate the funds owed to clients, and then prepares the necessary forms for clients to complete, sign, and mail to the appropriate states or entities. After the client has received their repayment and notified Keane, the client is invoiced for Keane’s success-based fee, determined by the recovered asset value. More recently, Keane began offering a Consulting-based service, LRR, to reduce clients’ unclaimed property liability and retain lost account owners through enhanced outreach efforts. While not directly related to CAR, LRR aims to protect client assets through the identification of items in the company’s unclaimed property inventory that may not be considered true obligations. Keane reviews the holder’s unclaimed property populations to locate items that do not require escheatment through the identification of exemptions that might not be known to the client. When applied, the LRR process can effectively protect items from escheatment, identify areas of potential cost savings, and bolster clients’ existing compliance efforts. Sandra Willard and Paul MacCready have, respectively, led Keane’s CAR and LRR efforts and are the top subject matter experts for these services. We recently sat down with them to understand the similarities, differences, and key objectives of each service that help our clients reduce liabilities and claim funds that are rightfully theirs. Who is an ideal candidate for each service? PM: For LRR, an ideal client is any company with a relatively large amount of General Ledger items like vendor checks or accounts receivable credits. SW: For CAR, we retrieve funds for any type of company, and Keane has clients from a variety of industries who utilize Corporate Asset Recovery. What companies would see the most benefit from utilizing each service? PM: Any company with an interest in reducing their unclaimed property exposure due to the states. While larger entities can experience greater return on their investment, smaller companies can also benefit from the identification of key transactions that can result in material savings. Savings that would be considered a “rounding error” to a Fortune 500 company could cover a smaller company’s entire unclaimed property outsourcing fees. had a large number of address changes in their history. What is the individual benefit of each service to the clients who utilize them? from “over compliance” by escheating when the property is considered exempt. How do companies benefit financially from using these services? What are the short-term and long-term benefits from each service? PM: In LRR the financial benefit can happen in two forms: the identification of non-reportable transactions can drop straight to the bottom line (when we identify an overpayment/duplicate payments) or it can be, at a minimum, a help to cash flow when we identify funds that may be owed but can be deferred until utilized by customers. Higher customer satisfaction can also be a long term byproduct. Our outreach efforts clarify balances and, sometimes, result in reissued payments. Customers as well as vendors appreciate the assistance in getting their accounts balanced. SW: Overall, the immediate benefit of CAR comes from the increased revenue to the company – money coming in is always good, isn’t it? In the short term, clients can expect to see a benefit from simply recovering funds sitting with an entity or court that the client did not know existed, and in the long run Keane’s efforts will eventually fall into the pattern of continually recovering escheated funds and uncashed checks to prevent assets from prolonged periods of abandonment. What is the main goal for Keane and for the client in using this service? PM: Simply put, the focus is compliance first and preservation of client funds second. Without LRR, automation in accounting systems combined with the complexity of escheat laws has created an environment where “escheat everything” has been a prudent choice. Like with any other attempt to eliminate waste, LRR creates savings by reducing unnecessary disbursements. SW: Our goal is to locate the missing funds to bring in extra income, increase the company’s revenue overall, and recover the funds for our clients. What are the potential outcomes of an engagement? PM: The best outcome is the identification of a significant number of material transactions that have been previously satisfied and should not be considered unclaimed property. The worst outcome for Keane is that we do not find anything, but, in those cases, there is no fee (LRR fees are contingency based for precisely this reason). Even then, there is value to the client as we have validated the efficacy of their internal procedures. SW: If we do not find anything to recover, it shows that the company is obviously doing a great job with their compliance efforts, and our process validates their efforts are working. What is the average claim volume for recovering corporate assets? the number of claims alone can speak to our efforts. What is the average volume of savings uncovered through LRR? PM: LRR found over $1M in savings for clients in 2018. Outcomes for individual companies is tough to predict because of variances in geographic footprint, property types, and their internal procedures. Since LRR fees are contingency based, clients only incur an expense if they also see savings – so we encourage clients to test out the service. How long does an engagement typically last for either service? Are there clients that have only used this service for a certain amount of time, or are there other options besides an ongoing engagement? PM: Keane would see an LRR engagement as an ongoing, annual process for most companies. In our experience, there may be times when a company will engage us either because of an acquisition or specific population that has been identified for a special project, or because they are trying to come into compliance and would like assistance with their research and remediation efforts. Those projects generally last 3-6 months, with the length dependent on Keane having adequate access to necessary information. SW: We’ve had clients sign two-year agreements, thinking that at the end of the engagement they will have cleared out all assets that may be sitting in the states or wherever the funds are held, but in Keane’s experience clients generally find it in their best interest to utilize these efforts on a recurring basis. Money can continually be recovered using CAR, so clients using this service do not usually opt out after the first two years. Most will want to continue Keane’s efforts to see what else can be recovered. That being said, we can commit to a shorter term to recover funds on a client’s behalf, but they would find it to be in their best interest to continue with our services. How long does it take to complete each step in the process for each service? PM: Projects often involve clarification with clients about the transactions involved so the timeline can vary. However, Liability Reduction can generally be completed start-to-finish in 30 days or less. Remediation, because of its outreach component, is variable. Keane once confirmed in just three days that over $47,000 of apparent accounts payable items had actually been paid but not reconciled, thus eliminating those funds from escheat the following month. That is an extreme example and most projects last three to six months mostly because of the time it takes to make contact and obtain the appropriate supporting documentation. SW: There are two major steps to the CAR process. The first part of the engagement is concentrated on submitting claims for all assets we’ve identified to recover on the client’s behalf, and the second part focuses on the client receiving payment. The initial volume of claims to be submitted ultimately depends on the number of subsidiaries and locations attached to the company; however the first round of claims documentation is typically provided for the client’s submission within a month of receiving the necessary information to begin research efforts. Depending on the state or entity holding the funds, clients can expect to start receiving payments on their claims between three months and a year of submitting the claim; in our experience, the payment process averages about six months per claim. How can you measure the success rate for recovering lost assets from county, municipal, or bankruptcy courts? SW: County and municipal funds are usually much easier to recover, and we find they are recoverable around 99% of the time. Bankruptcy courts can be difficult though, depending on which court you’re working with to recover the funds. Some courts will require the client to include a signature and seal on every authorization document sent, which some companies are unable to provide, and other courts sometimes have requirements that make the recovery process near impossible to complete. Of the ones that are more cooperative, we estimate the success rate of recovery is around 90%. How can you measure the success rate for uncovering exemptions and increasing company income using LRR? PM: Once we have targeted a population for remediation, our rule of thumb is to expect a 50% success rate. That number is obviously subjective, as each client’s inventory will be different in both volume and types of items to be worked, and we cannot pinpoint an exact measure of success until we know what the inventory entails. In terms of exemptions and other areas where we can identify property considered not currently due, Keane’s success rate depends greatly on the client’s geographic footprint – where they are located, where their customers keep their assets, and the state in which the company is incorporated all play a factor in the success of this program. One area where we pay particular attention is the client’s costs for annual reporting and compliance efforts. We consider it a success to find savings for the client that materially offset what they are paying for annual compliance support.  Some clients consider their unclaimed property area to be another profit center when they consider their costs versus funds saved by LRR and/or reclaimed by CAR. What makes each service unique to Keane? What makes Keane stand out to provide these services compared to another unclaimed property service provider? PM: LRR crosses a bridge between AP/AR cleanup efforts and unclaimed property reporting. Because of the compliance concerns arising out of escheat requirements, we think Keane is particularly well suited for this work. Remediation efforts that do not account for future documentation requirements could create unwelcome and costly surprises. Keane offers clients the confidence of a company that actively monitors statutory compliance, has immense experience as a holder advocate in audits and voluntary disclosure agreements, houses one of the industry’s premier consulting groups, and relies on its own proprietary reporting software. We have found that in situations where LRR is needed, having Keane’s blend of knowledge and experience readily available throughout the engagement is vital to the company’s overall unclaimed property compliance. SW: We have found that historically the main concern regarding CAR is that other providers may only look for the high-dollar items to claim, whereas with Keane we search and recover all dollar amounts, no matter how small. In our experience, a lot of claims with lower dollar figures can quite often add up to much larger grand totals, so clients get a lot more bang for their buck when it comes time to invoice for Keane’s portion of the recovered funds. We also continually search for funds to return assets to you as soon as possible. Other recovery firms might only actively recover assets for a company semi-annually in accordance with yearly reporting cycle deadlines, so those claims are not paid out as quickly. Funds are paid directly to the client, which reduces any risks associated with payment, and the client is invoiced by Keane for the agreed upon percentage once the funds are received. What really makes Keane unique is our guarantee to return fees paid out on claims in the event a client is asked to return their payment. We are proud to say we have never had to return a fee, and we are very cautious to ensure we are only recovering funds that belong solely to our client. What makes each service unique compared to the other options available to holders regarding these services? PM: Holders can attempt to mimic LRR internally but turnover and keeping associates current on changes will always be a concern. At Keane, unclaimed property is not a seasonal job and it is not a stepping stone to a position elsewhere. We have the utmost respect for our clients and support them even in their efforts to manage unclaimed property related activity in-house, including LRR like efforts. The business reality, however, is that unclaimed property is not a core business to any of our clients while it is for Keane. I know that can be used is to engage a recovery provider, like Keane. Does either service offer optional components that certain industries could utilize to strengthen their unclaimed property efforts? What can Keane offer that would supplement this service that might not be available, either on its own or from another provider? PM: Ideally, we like to see the LRR process (and even CAR) bundled as part of a fully comprehensive approach that starts much earlier. One of the shortcomings in this industry (in my opinion) is that our focus and scope is very much attuned to the dormancy of property types. Rather than waiting for a 3 or 5 year dormancy period to near its end, we are promoting a more proactive approach beginning at the one year mark. Our goal would be to attack and reduce a client’s inventory from all sides. Using analysis and outreach, we can facilitate checks getting cashed rather than reported while we simultaneously identify and remove accounting errors. Where accounts are involved, we can generate contact long before due diligence is even a factor thus maintaining assets under management. The ultimate target would be a reduction to its lowest level of the service most clients rely on us for: unclaimed property reporting. What do companies tend to miss out on by not performing these services at all, whether it is something they are not aware of or feel is not necessary? Where would they miss out by handling the process in-house, or not performing the process at all? Services, to get truly payable items reissued, it will be interesting to see how low we can reduce their ultimate reporting volume. SW: Within older companies, the employees that are responsible for recovering property (or have at least tried) do not have a full understanding of their company’s background, including mergers and acquisitions or dissolution history. They may not realize the company has subsidiaries that are no longer used but could still have assets tied to them, or they are unsure of how to prove an old address or ownership of the funds. By using Keane, we handle the process for them and remove all uncertainty about the information needed to reclaim the money. We research the company to find out everything there is to know about past history, unused subsidiaries still owned by the company, or even what each state requires within the claim process for recovering funds. The bottom line is that these companies miss out on real, hard-earned money that is available for them to recover simply based on what they just do not know. What is the knowledge and expertise behind these services? Where does Keane have the upper hand? PM: The biggest element to factor into the decision to utilize these services, especially for companies that look at this from a standpoint of unclaimed property compliance is, what happens if there is an audit? Documentation is often disregarded out of lack of knowledge. Either unclaimed property audits are not considered or the resources involved do not know what will be considered acceptable evidence. Voids/reversals that are made without appropriate backup create an unnecessary risk should an audit occur. What makes LRR by Keane especially unique is that this service is a blend of Keane’s Compliance and Consulting know-how into one service; we are able to show that Keane utilizes the best of both departments for our LRR clients’ benefit. Documentation is a key component of our remediation effort so that today’s savings do not lead to larger costs in a future audit.